Whether you prefer sleek, modern and minimalistic, or smooth and colourful retro stylings, there’s a Swan microwave that’s perfect for you. Renowned for manufacturing high quality microwaves that deliver excellent performance, incredible reliability, and fantastic good looks, Swan are one of the most trusted names in kitchen appliances. 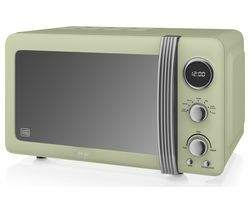 Swan microwaves are available in a variety of shapes, styles, colours and specifications. Offering 5 power levels with a maximum microwave power of either 800 W to 900 W, depending on which model you choose, every model comes with a number of different programmed functions, ensuring all Swan microwaves are both versatile and easy to use. While Swan are particularly well known for their retro designs, they also manufacture a number of contemporary designs, all of which will slide easily into any kitchen setup. Every model in our Swan range has a capacity of 25 litres, and is easy to clean and maintain. They’re designed to be completely compatible with a fast-paced, modern lifestyle, making them a good choice for individuals, couples and families. 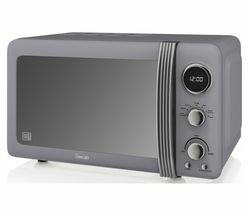 If you’re looking for something a little different, you may want to take a look at a combination microwave. Mixing microwave technology with other cooking methods, such as grills and convection ovens, they’re a fantastically versatile tool that pack a lot of power into a very small space. Customers can also see our integrated microwaves if they want an appliance that will fit easily into existing kitchen space.